They fled their flooded homes but the rains could not stop their love. Despite the flooding that drove them from their homes, Ratheeth and Ammun get married at a Believers Church School relief camp. The rains came down incessantly causing severe flooding in southern Indian state of Kerala. 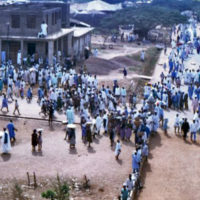 Whole villages and towns were destroyed in a matter of days. Partnered with the Indian government, GFA-supported relief camps provided food, shelter, and basic supplies to those fleeing the floodwaters. Ratheesh and Ammu are two of many who found shelter at a Believers Church School in Alappuzha. But they’re a little different. In the months before the flood, they had been preoccupied with one thing–their wedding. It was originally scheduled to be on August 21st, but Ammu’s home was completely submerged by the waters. She and her entire family had no other choice but to evacuate. The wedding was postponed. However, Ratheesh and Ammu didn’t want to wait for the floodwaters to slowly recede before being able to begin their lives together. Ammu’s father spoke with officials and they coordinated for a wedding to be held at the flood relief camp at the Believers Church School. On August 27th, 2018, Ratheesh and Ammu tied the knot. Over 800 people were served at their reception, which was attended by authorities, politicians, religious leaders, activists, and many, many others. The couple then left for Kannur that evening with a happy story to tell despite the historic flooding. This entry was posted in News and tagged Believers Church, disaster relief, Flood, Flooding in Kerala, GFA, relief camps, wedding. Bookmark the permalink.